Middlesbrough climbed to fifth in the Championship table as Britt Assombalonga's first-half goal proved enough to see off 10-man Blackburn. Boro's top scorer headed the winner on 19 minutes before Rovers lost Derrick Williams to a straight red card just before half-time. 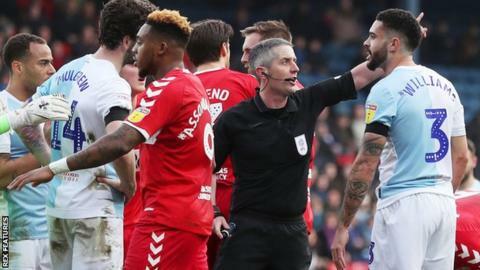 It condemned Blackburn to a fourth successive defeat while Boro claimed a first win in three league games to leapfrog Bristol City and climb one place. Assombalonga's 12th goal of the season gave Middlesbrough just their third victory in the last 18 league meetings between the clubs. Boro tested David Raya early with a header by Ashley Fletcher from a Lewis Wing cross, but Raya was beaten for the opening goal inside 20 minutes. Charlie Mulgrew misjudged a high ball, allowing Fletcher to dart behind him and cross for Assombalonga to score with a far-post header. Williams was dismissed in the final minute of the first half when he brought down Fletcher on the edge of the Blackburn penalty area and was deemed by referee Darren Bond to have denied a clear goalscoring opportunity. Early in the second half Wing drove forwards from midfield and rattled the crossbar with a dipping, long-range shot before Amari'i Bell, one of Blackburn's three half-time substitutes, struck the crossbar with 14 minutes remaining. It is the first time Blackburn have lost four consecutive games since 2016 and the first time under current manager and Boro legend Tony Mowbray, but the run has left them 10 points outside the play-off places. Middlesbrough manager Tony Pulis is now unbeaten in his last nine league meetings with Blackburn and his side are seven points behind the top two with a game in hand. "I couldn't recognise my team first half. I've been here two years next week and I don't know where that came from to be honest. "I said to them at half-time that it's an unrecognisable football team from the one I see week in, week out. "Today we lacked fire, desire and energy. "Win, lose or draw, we have more fight and desire and quality than we showed in the first half. Second half was better." "I'm pleased. I don't want to take the gloss off it because I thought we were very good today, but to get 27 shots on goal and just score one goal is something I've kept harping on about since I joined the football club. "We've got to be more clinical in front of goal. We had really good opportunities to get the second one, and if you get the second one it's game over and you can relax a little bit. "What we've got to do is replicate the intensity we showed against Leeds for home games for the rest of the season and that gives us a chance." Match ends, Blackburn Rovers 0, Middlesbrough 1. Second Half ends, Blackburn Rovers 0, Middlesbrough 1. Corner, Blackburn Rovers. Conceded by Lewis Wing. Attempt missed. Stewart Downing (Middlesbrough) left footed shot from the left side of the box is too high. Corner, Middlesbrough. Conceded by David Raya Martin. Attempt saved. Britt Assombalonga (Middlesbrough) left footed shot from the centre of the box is saved in the bottom left corner. Assisted by George Saville. Attempt missed. Stewart Downing (Middlesbrough) right footed shot from outside the box misses to the left. Assisted by John Obi Mikel. Attempt blocked. Lewis Wing (Middlesbrough) right footed shot from the centre of the box is blocked. Attempt blocked. Lewis Wing (Middlesbrough) right footed shot from outside the box is blocked. Attempt saved. Bradley Dack (Blackburn Rovers) right footed shot from the centre of the box is saved in the centre of the goal. Assisted by Danny Graham with a headed pass. Attempt missed. Lewis Wing (Middlesbrough) right footed shot from the centre of the box is high and wide to the left. Assisted by Stewart Downing with a cross. Substitution, Middlesbrough. Jordan Hugill replaces Ashley Fletcher. Offside, Middlesbrough. Ryan Shotton tries a through ball, but Ashley Fletcher is caught offside. Attempt saved. Ashley Fletcher (Middlesbrough) left footed shot from the right side of the box is saved in the centre of the goal. Assisted by Lewis Wing. Attempt missed. Danny Graham (Blackburn Rovers) left footed shot from the centre of the box is too high. Assisted by Bradley Dack. Attempt missed. Jonny Howson (Middlesbrough) left footed shot from outside the box is high and wide to the left. Assisted by Britt Assombalonga. Corner, Middlesbrough. Conceded by Ryan Nyambe. Attempt missed. Danny Graham (Blackburn Rovers) left footed shot from a difficult angle on the left is close, but misses to the left. Assisted by Adam Armstrong. Attempt missed. Britt Assombalonga (Middlesbrough) right footed shot from outside the box is high and wide to the right. Attempt missed. George Saville (Middlesbrough) left footed shot from the left side of the box misses to the right. Assisted by Jonny Howson with a cross. Corner, Blackburn Rovers. Conceded by John Obi Mikel. Attempt blocked. George Saville (Middlesbrough) left footed shot from the left side of the box is blocked. Assisted by Lewis Wing. Substitution, Middlesbrough. Paddy McNair replaces George Friend because of an injury. Attempt missed. Bradley Dack (Blackburn Rovers) header from the centre of the box misses to the right. Assisted by Charlie Mulgrew with a cross following a set piece situation. Elliott Bennett (Blackburn Rovers) wins a free kick on the right wing. Muhamed Besic (Middlesbrough) wins a free kick in the defensive half. Delay in match George Friend (Middlesbrough) because of an injury. Attempt missed. Ashley Fletcher (Middlesbrough) right footed shot from outside the box is too high. Assisted by Jonny Howson. Lewis Travis (Blackburn Rovers) wins a free kick on the left wing.